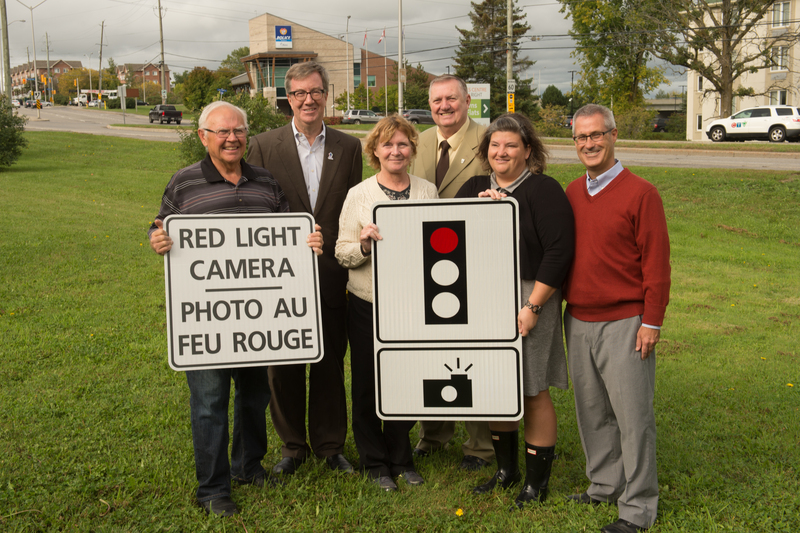 October 3, 2016 – Today, Mayor Jim Watson, Councillor Keith Egli, Chair of the City’s Transportation Committee, and Orléans Councillor Bob Monette unveiled a new red-light camera at the intersection of St. Joseph Boulevard and Old Tenth Line Road, making it the first of five new red-light cameras that will be installed throughout the city in 2016 with 15 more to be installed in 2017. These 20 new red-light cameras will be in addition to the existing 34 red-light cameras currently in operation at locations across Ottawa. The City installs cameras at intersections based on collision rates. The program’s objective is to improve intersection safety by decreasing the number of red-light running occurrences. Collisions resulting from red-light running tend to be more severe than other intersection collisions because they usually involve at least one vehicle travelling very quickly. In 2014, there were 655 reportable angle collisions at signalized intersections in the city. Red-light cameras take two photographs: the first is taken when a vehicle is about to enter an intersection with a red light, the second photograph shows the offending vehicle in the intersection. The fine for running a red light is $260, plus a $5 service fee and $60 victim surcharge.